How many different "fermata" shells are possible? Re: How many different "fermata" shells are possible? 465. "ripresa + 4 botti + ripresa". 466. (4 botti + 2 intrecci) + controbomba + (4 botti + 2 intrecci) + 2 controbombe. 467. (scala a 8 sfere) + (intreccio + botto + intreccio + botto + intreccio) + (2 intrecci). 468. (intreccio + 2 botti + intreccio + 2 botti) + (intreccio + 2 botti + intreccio + 2 botti). 469. (ripresa + scala a 8 botti) + (ripresa + scala a 8 botti). 470. 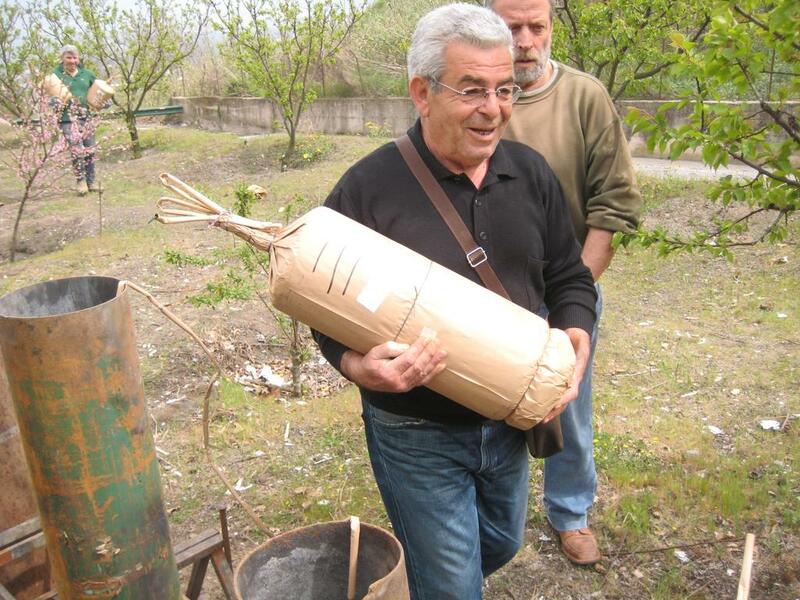 (intreccio + 4 botti) + (intreccio + 4 botti) + controbomba. 471. (6 riprese) + (6 riprese) + controcolpo. 472. (4 botti + ripresa) + (4 botti + ripresa). 473. ripresa + 4 botti + ripresa + controcolpo. 474. (intreccio + botto + intreccio + botto + intreccio) + (scala a 8 botti) + (2 intrecci). 475. (2 intrecci) + (3 intrecci). 476. (4 sfere + intreccio + 4 sfere + intreccio) + controbomba. 477. (scala a 8 botti) + (3 riprese) + (3 riprese). 478. (controbomba + ripresa) + (controbomba + ripresa). 479. (4 botti + 3 riprese) + controbomba. 480. (scala a 8 sfere) + (4 botti + 2 riprese). These photos were taken in the Province of Naples on April 2nd, 2016 preparing for a competition in the town of Somma Vesuviana. This shell with the superscription "3*" written on the outside indicate "3 intrecci". The complete effect is 3 successive mosaic, the first is a splendid mosaic of 7 color bombettes in "pampanella" (white) followed by a second mosaic of 7 color bombettes in blue "Pupatelle" stars and a third mosaic of 7 titanium salute bombettes. There are 2 of this type of 21 cm caliber, 1-break shells in this evening display. 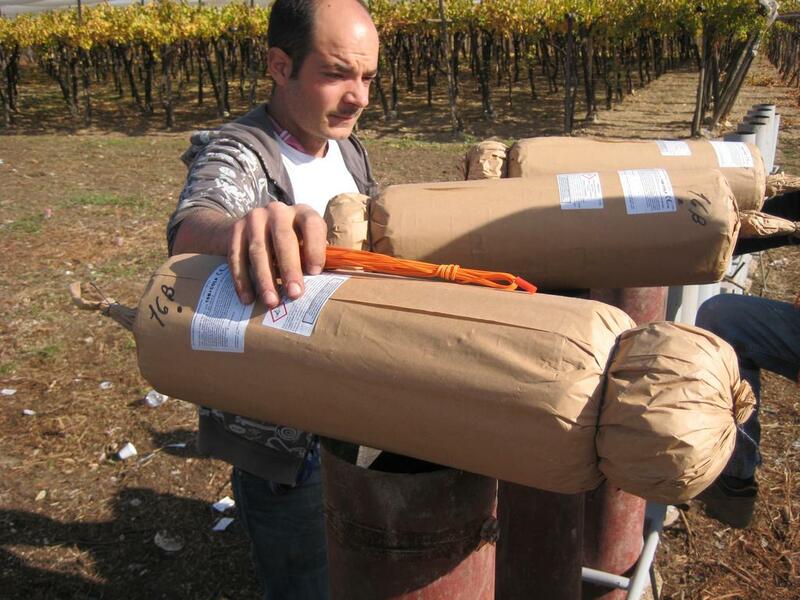 In the first photo you can clearly see the superscription on the shell in the hands of Luigi Nappi. 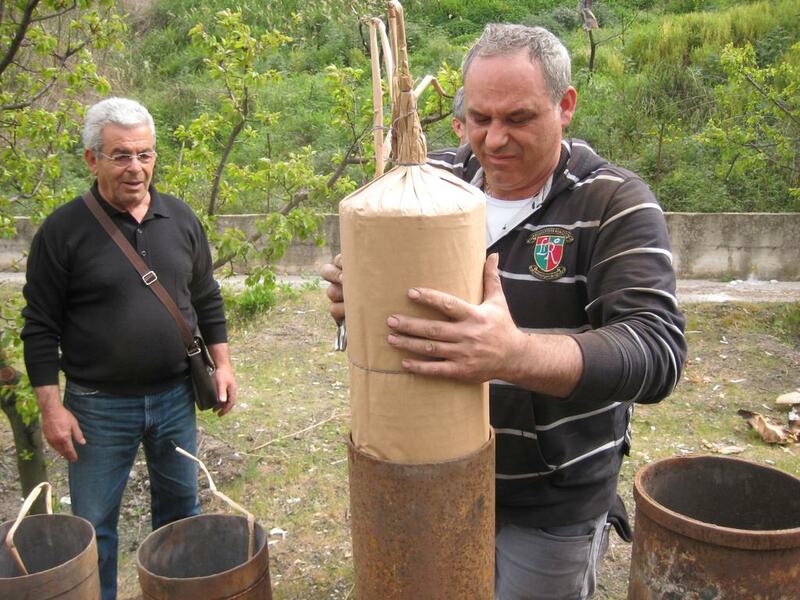 In the second photo this shell on the mortar and Luigi Nappi taking two other "fermata" shells. In the third photo Luigi to load this shell. In the video between minute 8.21 and 8.39. Ultima modifica di stutata 28 il mercoledì 1 agosto 2018, 23:07, modificato 1 volta in totale. These photos were taken in the Province of Bari on November 9th, 2017 preparing for the daylight Festival San Trifone on November 10th in the town of Adelfia. This shell with the superscription "4. *" written on the outside indicate "4 riprese + controcolpo". The complete effect is 4 successive mosaic of salute bombettes and closed by a bottom-shot. There are 5 of this type of 16 cm caliber, 1-break shells in this daylight display. 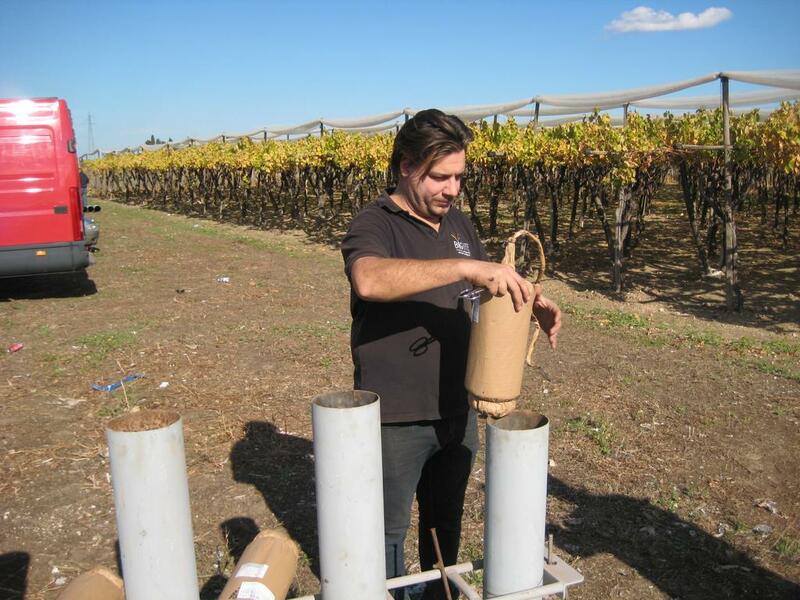 In the first photo two employees of Raffaele Boccia with three fermate in this effect. 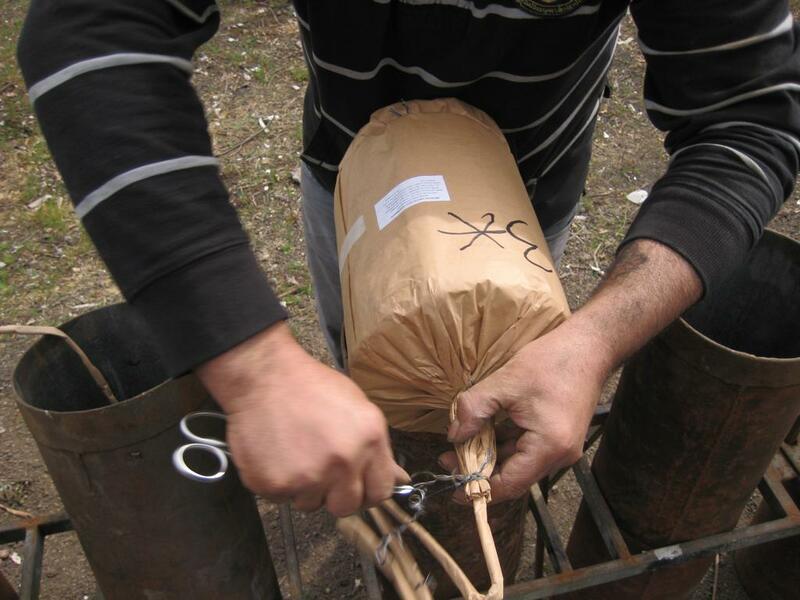 In the second photo an employee loading the first of the five fermate with the superscription "4. *", "4 riprese + controcolpo". In the third photo at the left side Aniello Boccia in the middle Raffaele Boccia and at the right side the employee loading the fifth and last fermata in this effect. In the video between minute 6.13 and 6.44. These photos were taken in the Province of Naples on April 2nd, 2016 preparing for the Festival in the town of Somma Vesuviana. This shell with the superscription "___ ___ ___" written on the outside indicate "3 controbombe". The complete effect is 3 successive large bouquets. In the first break a bouquet with a heart of purple spherical stars and rings of green cylindrical stars, in the second break a bouquet with a heart of blue spherical stars and rings of red cylindrical stars and in the third break a bouquet with a heart of red spherical stars and rings of green cylindrical stars. There are 2 of this type of 21 cm caliber, 3-break shells in this evening display. 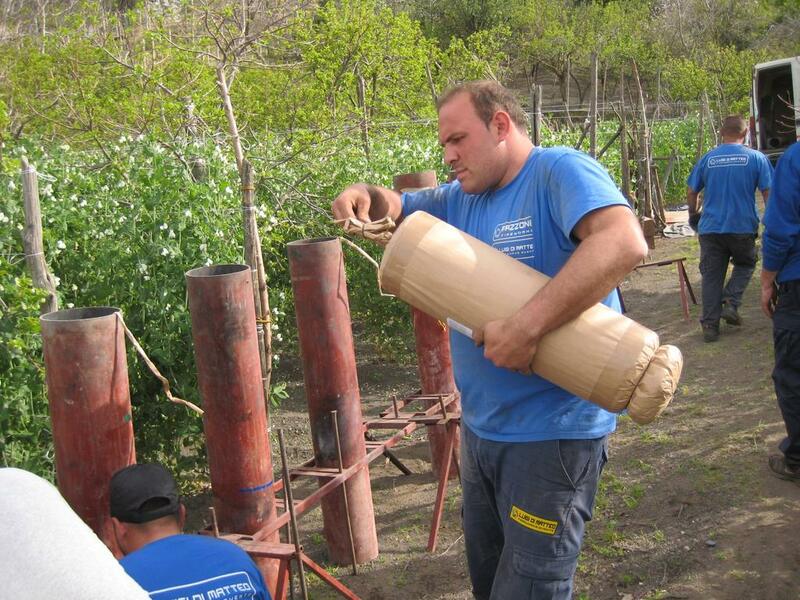 In the first photo an employee of Boccia & Nappi with a fermata shell with this superscription. In the second photo at the left side the employee with this fermata shell and on the right side Luigi Nappi with a "fermata" shell for the "tre per tre". 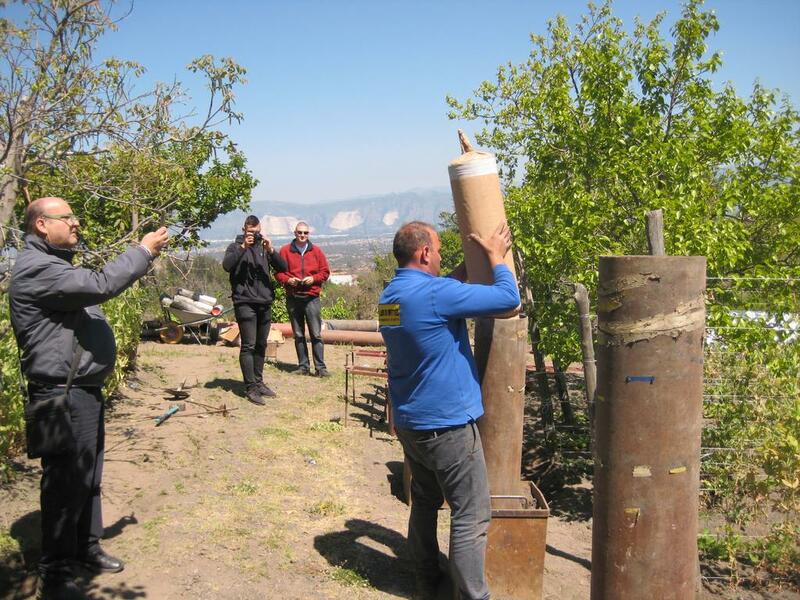 In the third photo the employee with this "fermata" shell in caliber 21 cm, fired after the "tre per tre" which means three successive "stutata" shells. 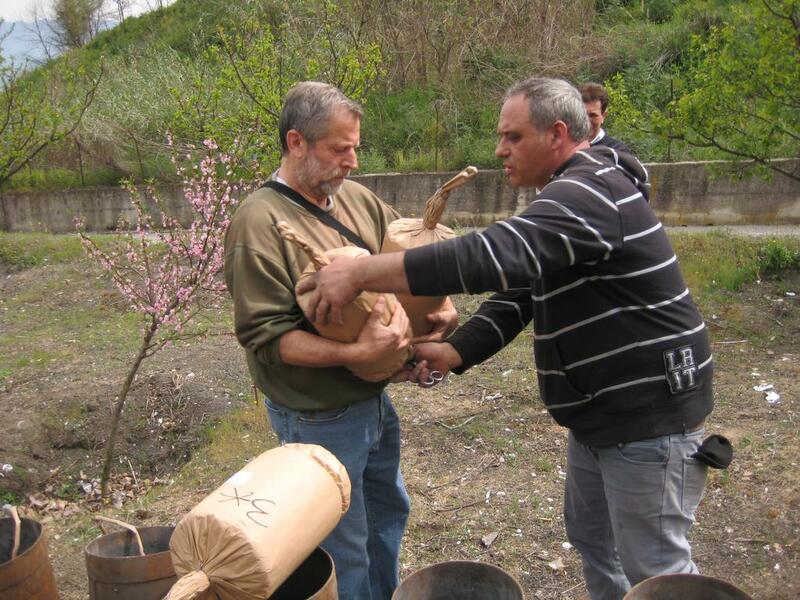 In the fourth photo Luigi Nappi loading this shell. In the video between minute 9.58 and 10.04 and minute 10.12 and 10.18. 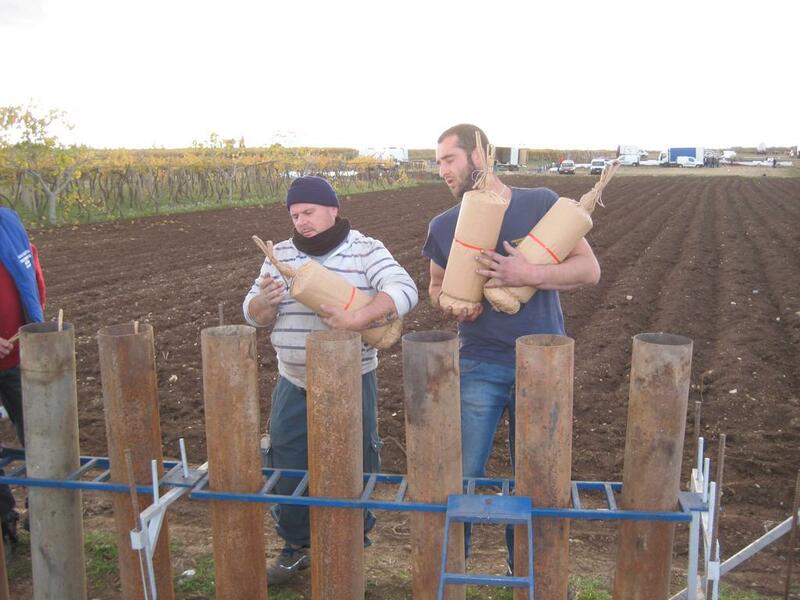 This daylight display was fired by the company of Antonio Bruscella from Modugno in the Province of Bari. This shell with the superscription "3X 8B 3X ." written on the outside indicate "(3 riprese) + (scala a 8 botti) + (3 riprese) + controcolpo". The complete effect is 3 successive mosaic of salute bombettes in the first break, 8 successive salute bombettes in the second break, 3 successive mosaic of salute bombettes in the third break and closed by a bottom-shot. 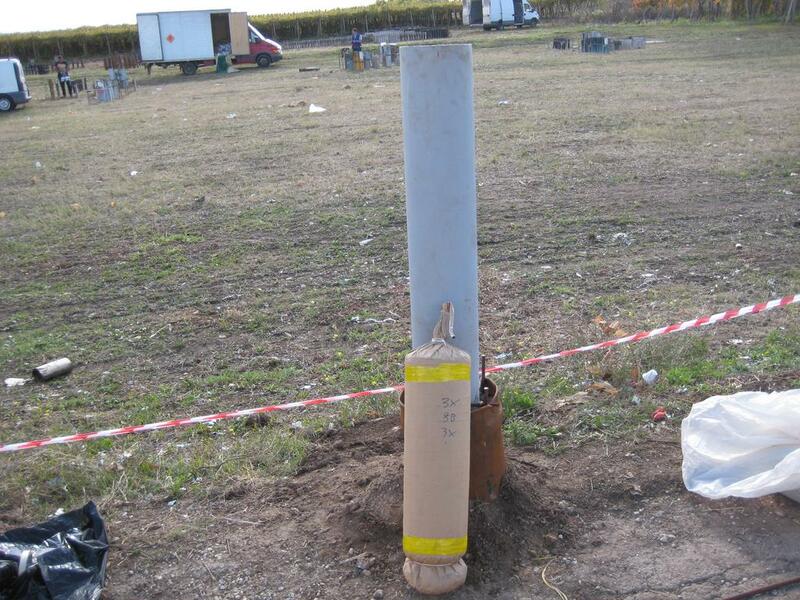 There are 2 of this type of 21 cm caliber, 3-break shells in this daylight display. In the first photo this "fermata" shell with the superscription "3X 8B 3X ." in front of the mortar. 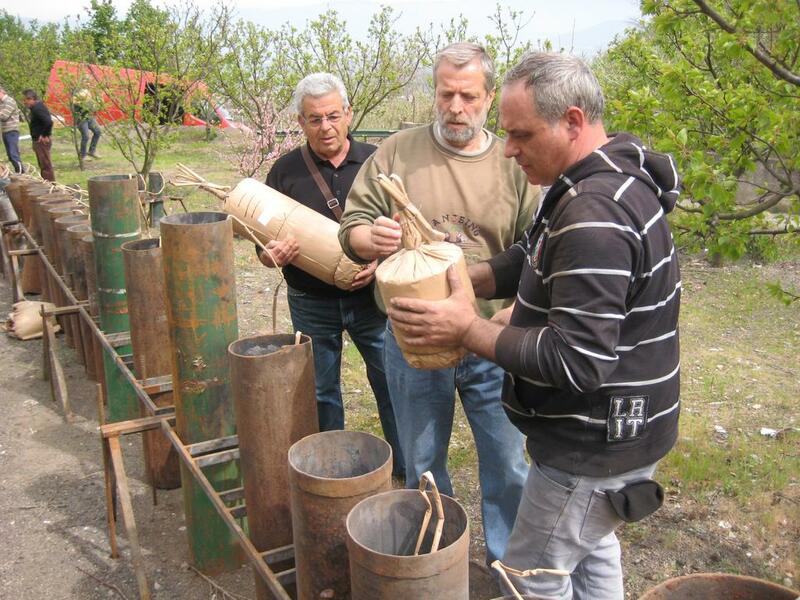 In the second photo the "fermata" shell with the complete mortar, the first one in this effect. 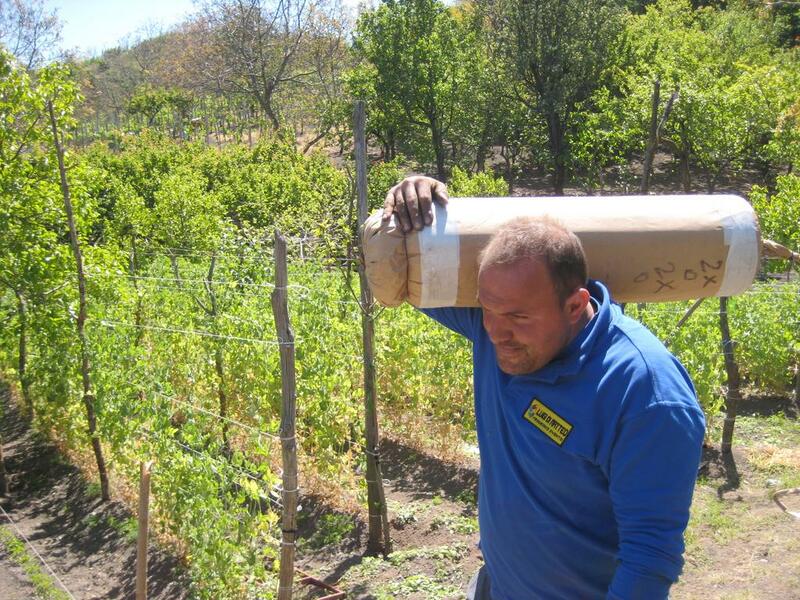 In the background the construction of the company of Vincenzo Senatore from Cava dei Tirreni in the Province of Salerno. In the video between minute 9.33 and 9.59. These photos were taken in the Province of Naples on April 2nd, 2016 preparing for a competition in the town of Somma Vesuviana. 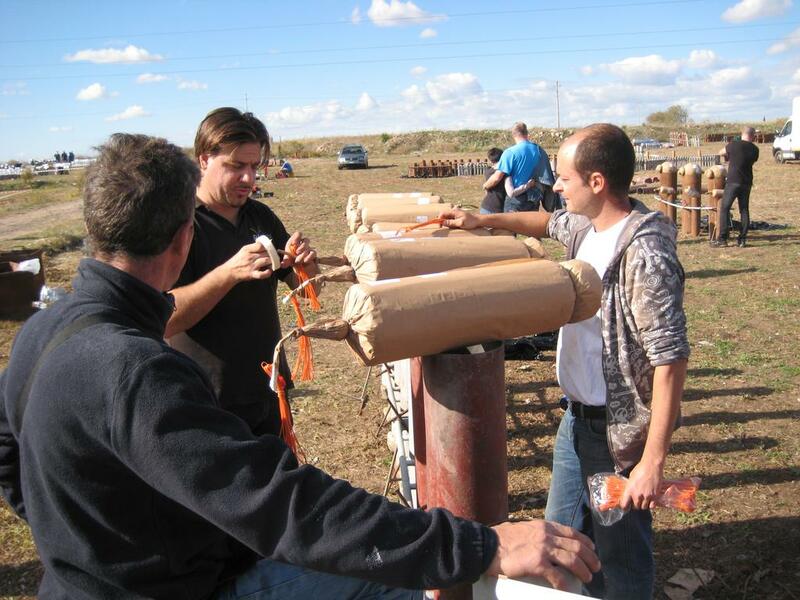 "Tre per tre" or "3 x 3" means that 3 successive cilindrical "stutata" shells are fired and open after eachother. The main difference with a sferical "stutata" shell is that the cilindrical shell opens at the lowest level at highest speed, the sferical shell at the highest level with lowest speed. The first "stutata" has the superscription "TG"(=Tremolante Giallo) written on the outside indicate the effect "goldglitter" and contains 14 color bombettes. 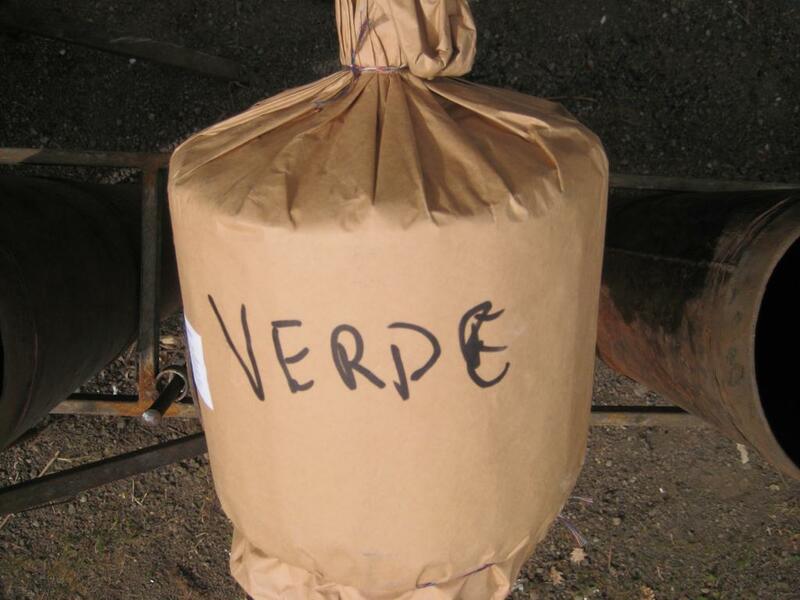 The second "stutata" has the superscription "Verde" written on the outside indicate the effect green "pupatelle" (= small) stars and contains 14 color bombettes. The third "stutata" has the superscription "Tix" written on the outside indicate the effect "titaniumsalutes" and contains 14 titaniumsalutebombettes. 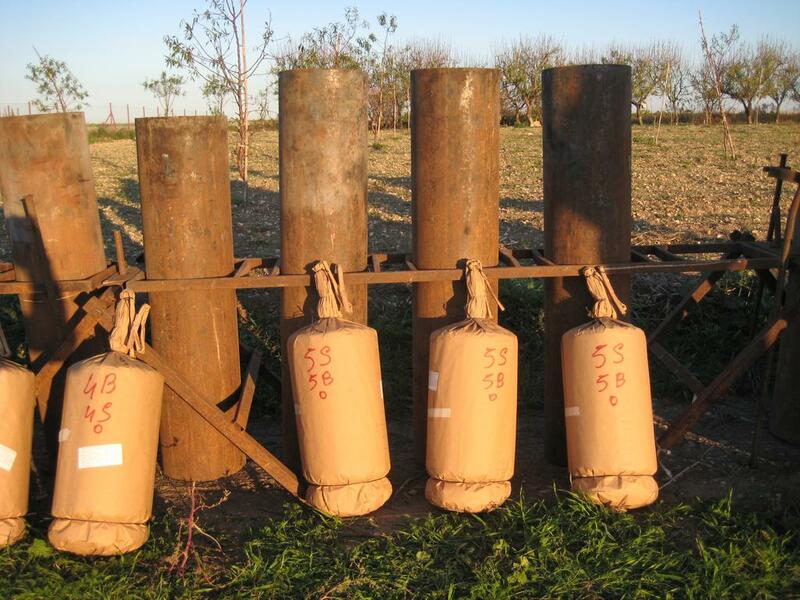 The three "stutata" shells are fast fired after eachother have to open one by one, also the bombettes of each shell have to open simultaneously after eachother. 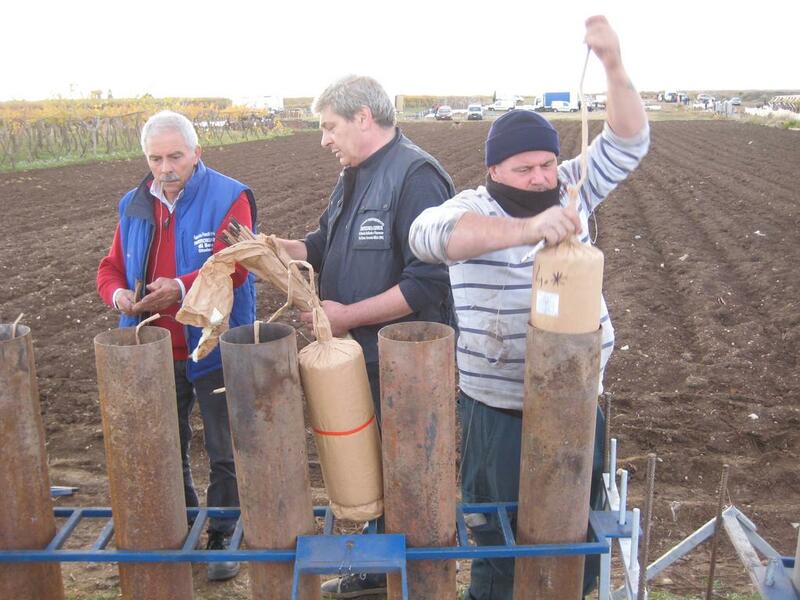 In the first photo the employee Michele Caiazza of the company of Giovanni Boccia and Luigi Nappi with three stutata shells in caliber 21 cm. 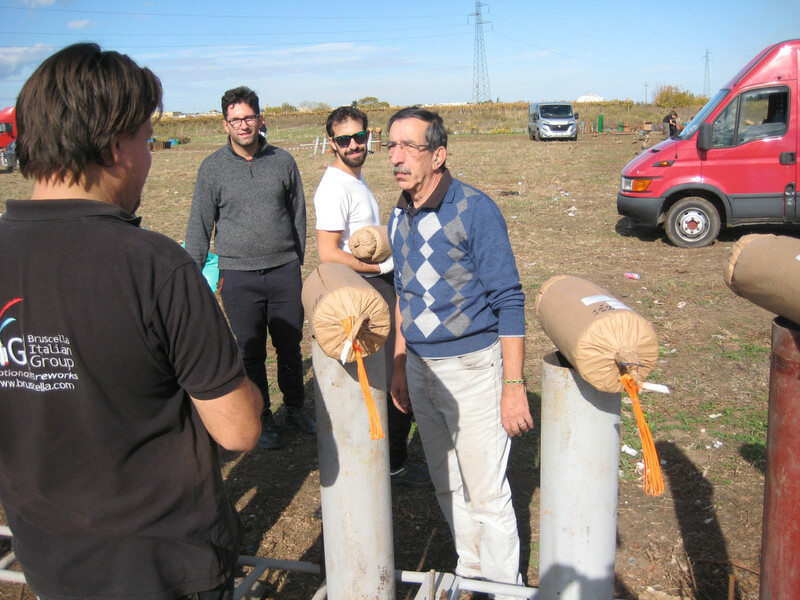 In the second photo at the right side Luigi Nappi and at the left side Michele Caiazza with 2 stutata shells, the tubes from left to right are filled with the following "fermata" shells "2 controbombe"; "6 intrecci"; "2 controbombe"; 3 shorter tubes for the stutate; "3 controbombe"; 3 shorter tubes for the stutate; "3 controbombe". In the third, fourth and fifth photo the three stutata shells in the effects "tremolante giallo", "verde" and "Tix". An example of "fermata" shell number 93: "(scala a 8 botti + ripresa) + controcolpo". This shell with the superscription "8BR." 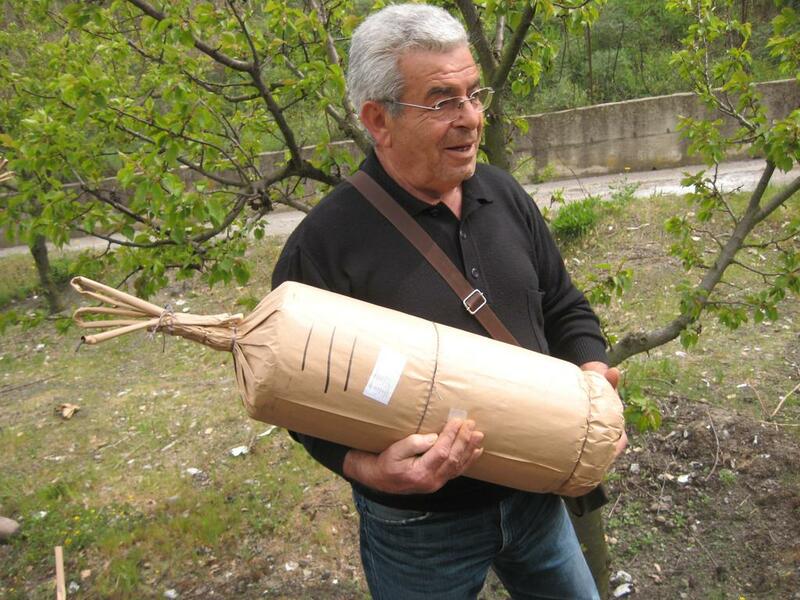 written on the outside indicate "(scala a 8 botti + ripresa) + controcolpo". The complete effect is 8 successive salute bombettes followed by a mosaic of salute bombettes and closed by a bottom-shot. There are 3 of this type of 15 cm caliber, 1-break shells in this daylight display. In the first photo this "fermata" shell with the written superscription "8BR." and on the label "8B X + colp", "8B" means "8 Botti" successively, "R" means "Ripresa" and the point means bottom-shot. In the second photo the second "fermata" shell in this effect. 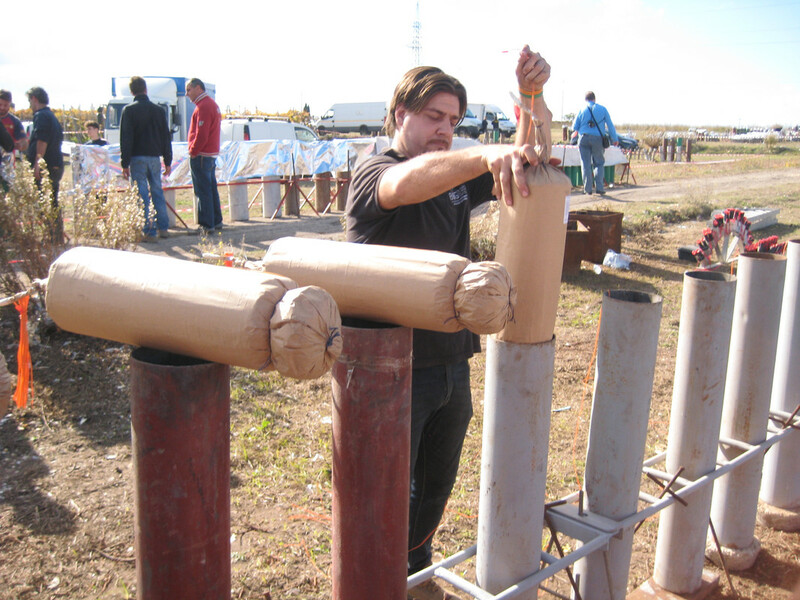 In the third photo Davide Di Bello loading the first "fermata" shell in this effect. In the fourth photo a view of the serie "fermata" shells of 15 cm caliber. 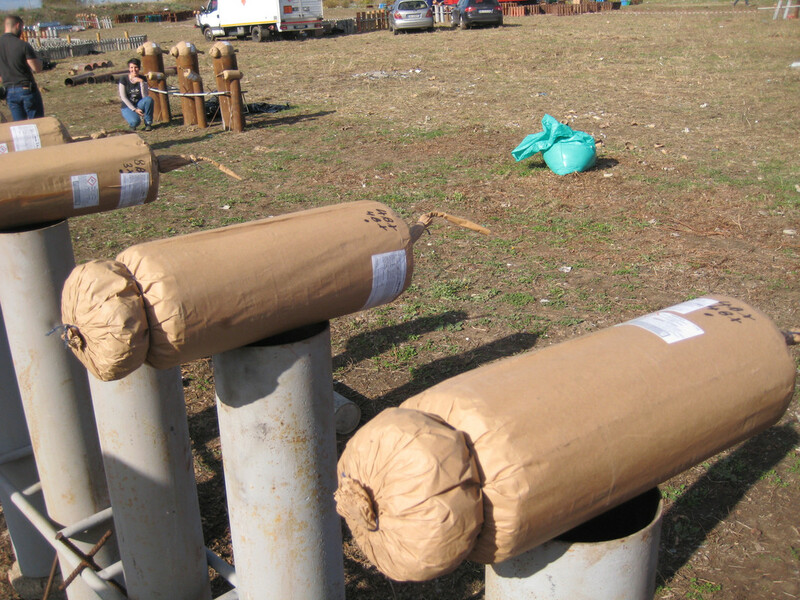 On the right side the first three mortars for the fermate in this effect. An example of "fermata" shell number 417: "(2 intrecci) + (controbomba) + (2 intrecci) + (controbomba) + controcolpo". These photos were taken in the Province of Naples on April 22nd, 2017 preparing for a competition in the town of Somma Vesuviana. 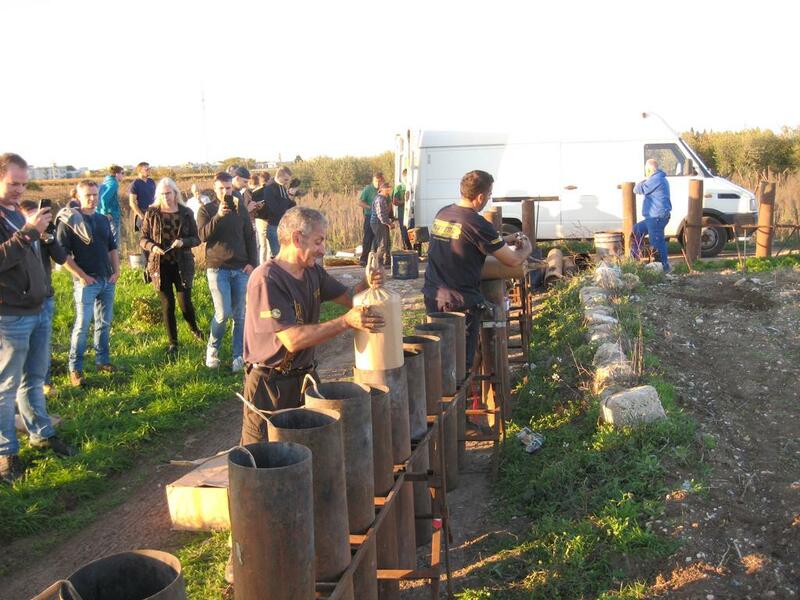 This evening display was fired by the company of Luigi Di Matteo from Sant'Antimo in the Province of Naples. 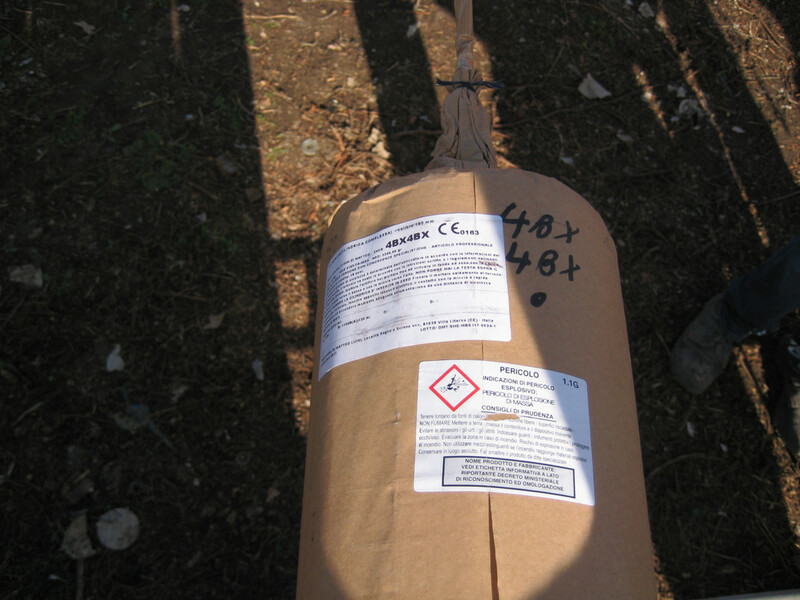 This shell with the superscription "2*o2*o", written on the outside indicate "(2 intrecci) + (controbomba) + (2 intrecci) + (controbomba) + controcolpo". The complete effect is 2 successive mosaic, the first is a splendid mosaic of 7 color bombettes in "pampanella" (= white) followed by a second mosaic of 7 color bombettes in goldglitter in the first break, in the second break a bouquet with a heart of red spherical stars and rings of yellow cylindrical stars, in the third break 2 successive mosaic, the first is a splendid mosaic of 7 color bombettes in "pampanella" (= white) followed by a second mosaic of 7 color bombettes in red "pupatelle" stars and in the fourth break a bouquet with a heart of red spherical stars and rings of green cylindrical stars, closed by a bottom-shot. There are 2 of this type of 21 cm caliber, 4-break shells in this evening display. In the first photo this "fermata" shell with the written superscription "2*o2*o". "2*" = 2 intrecci = 2 mosaic of color bombettes. o = controbomba = bouquet with a heart of spherical stars and rings of cylindrical stars. 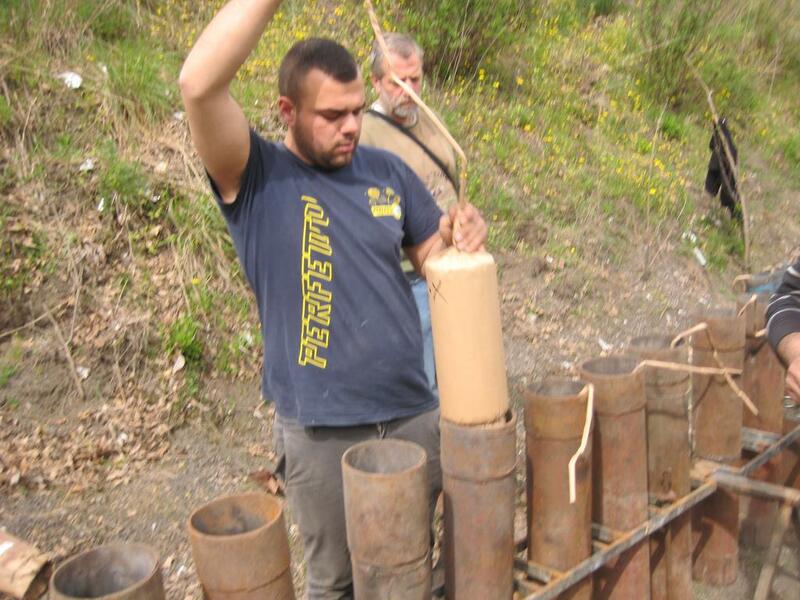 In the second photo is Luigi loading this "fermata" shell in mortar number 5. 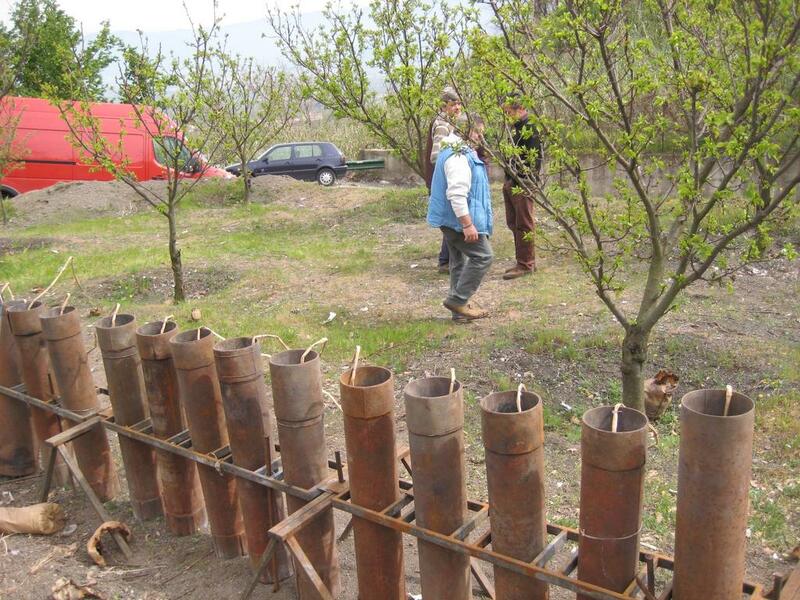 In the third photo Luigi with the second "fermata" shell in this effect for mortar number 6. 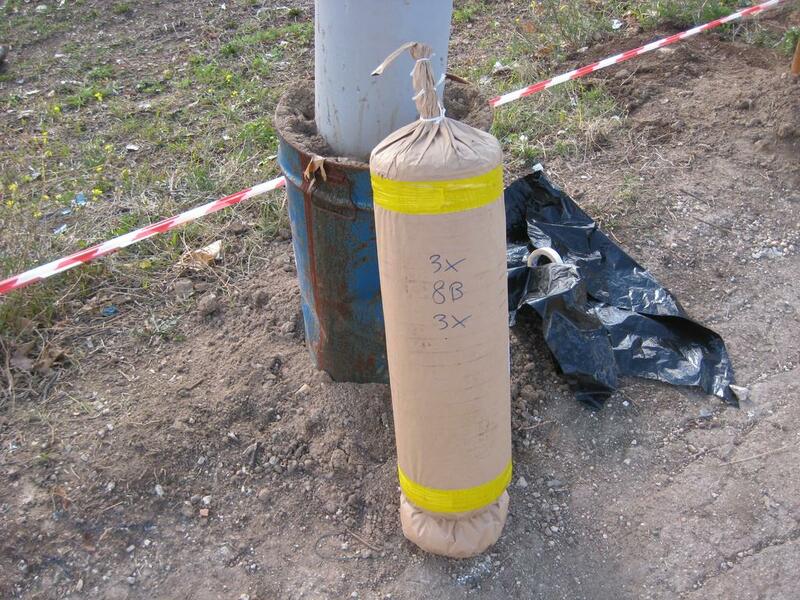 In the fourth photo "appassionati" following the loading of this "fermata" shell in mortar 6. In the video of Gecimali between minute 9.37 and 10.00. An example of "fermata" shell number 225: "(scala a 8 botti) + (scala a 8 botti) + controcolpo". This shell with the superscription "16B." written on the outside and "16B + colp" on the label indicate "(scala a 8 botti) + (scala a 8 botti) + controcolpo". The complete effect is 8 successive salute bombettes in the first break and in the second break 8 successive salute bombettes and closed by a bottom-shot. There are 3 of this type of 15 cm caliber, 2-break shells in this daylight display. In the first photo the three "fermata" shells with the written superscription "16B." and on the label "16B + colp", "16B" means "16 Botti" successively in two breaks, and the point means bottom-shot. "colp" = "controcolpo", and means bottom-shot. 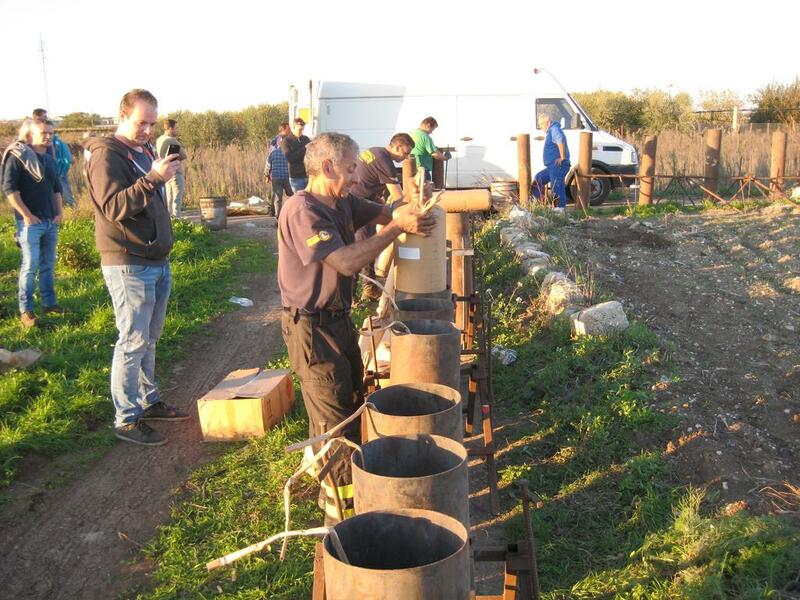 In the second photo on the left Davide Di Bello installing the electrical ignition in the third "fermata" shell in this effect. 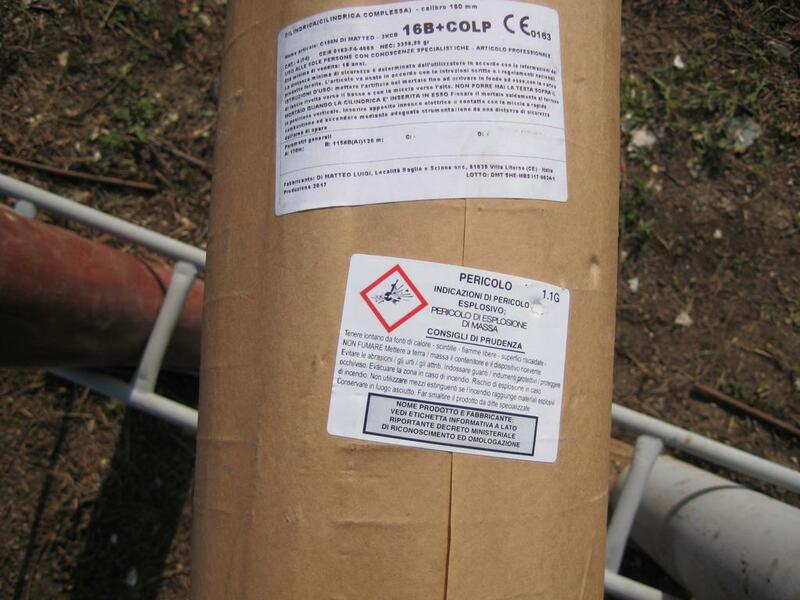 In the third photo the label with the superscription "16B + colp". 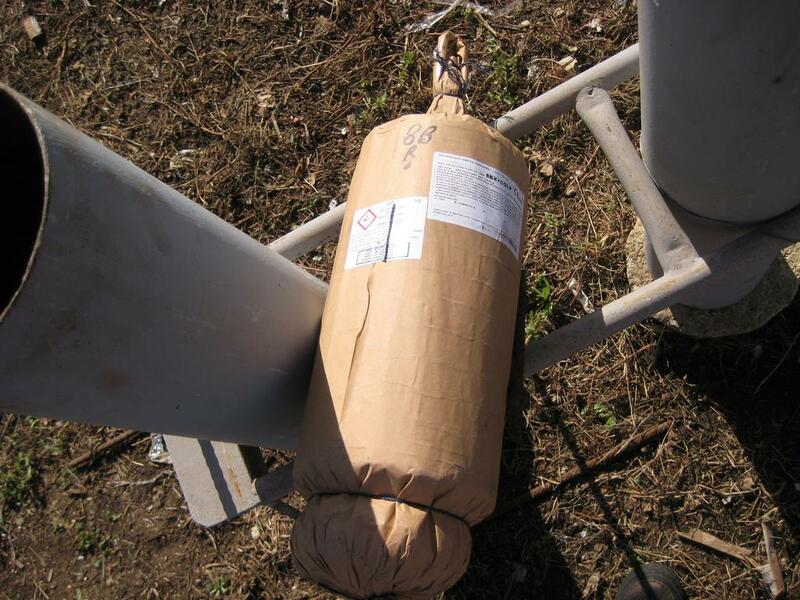 In the fourth photo the three "fermata" shells of 15 cm caliber in this effect on the red mortars. 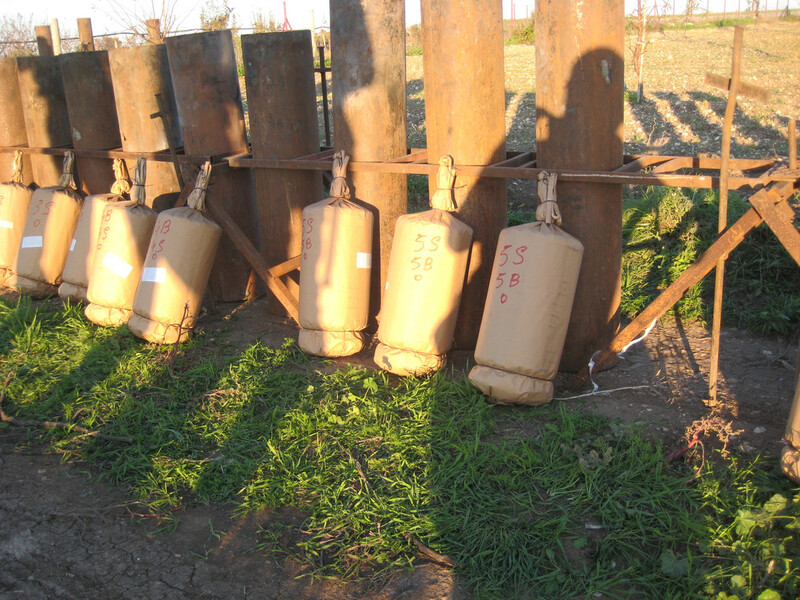 An example of "fermata" shell number 492: (4 botti + 4 riprese) + controcolpo. These photos were taken in the Province of Bari on November 9th, 2018 preparing for the daylight Festival San Trifone on November 10th in the town of Adelfia. 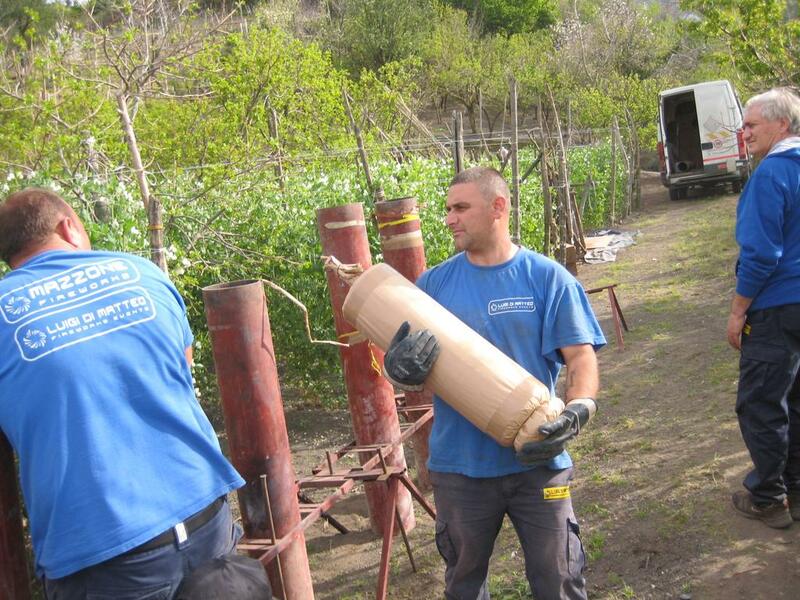 This daylight display was fired by the company of the brothers Senatore from Cava de Tirreni in the Province of Salerno, Regione Campania. This shell with the superscription "4S 4B o" written on the outside indicate "(4 botti + 4 riprese) + controcolpo". The complete effect is 4 successive salute bombettes followed by 4 successive mosaic of salute bombettes and closed by a bottom-shot. 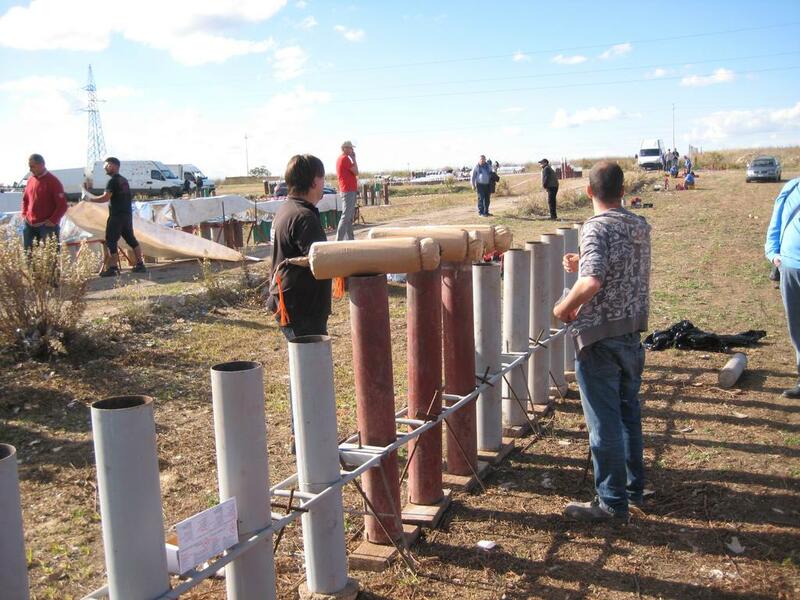 There are 3 of this type of 21 cm caliber, 1-break shells in this daylight display. 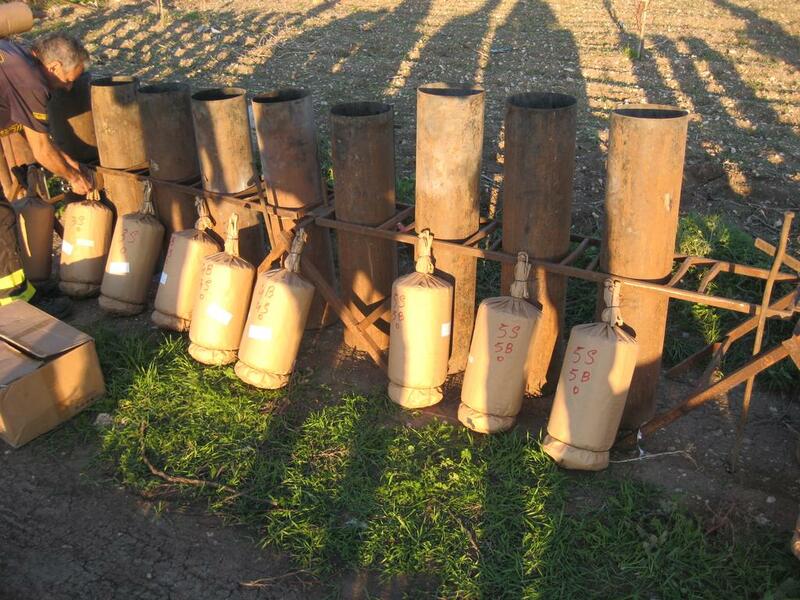 In the first photo the three "fermata" shells in the middle of the 9 shells with the superscription "4S 4B o" in front of the mortars. At the left side 3 "fermate" in the effect (3 riprese) + controcolpo and at the right side 3 "fermate" in the effect (ripresa + botto + ripresa + botto + ripresa + botto + ripresa + botto + ripresa) + controcolpo. In the second photo at the left side the third "fermata" shell in this effect with the superscription "4S 4B o". "4B" means "4 Botti" successively, "4S" means "4 Ripresa" successively and "o" means the bottom-shot. The letter "S" is possibly a dialect word in the Province of Salerno. 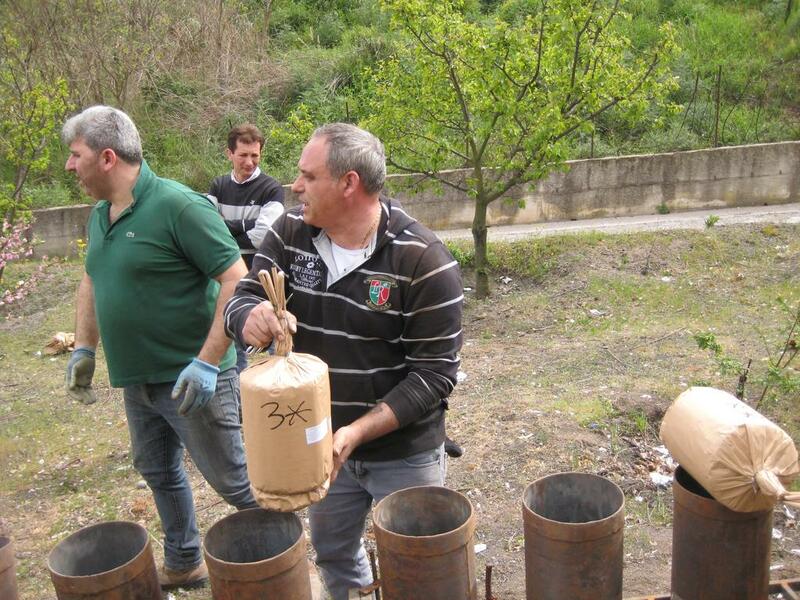 In the third photo Carmine Senatore loading the fifth mortar with a "4S 4B o", it is the second fermata in this effect. 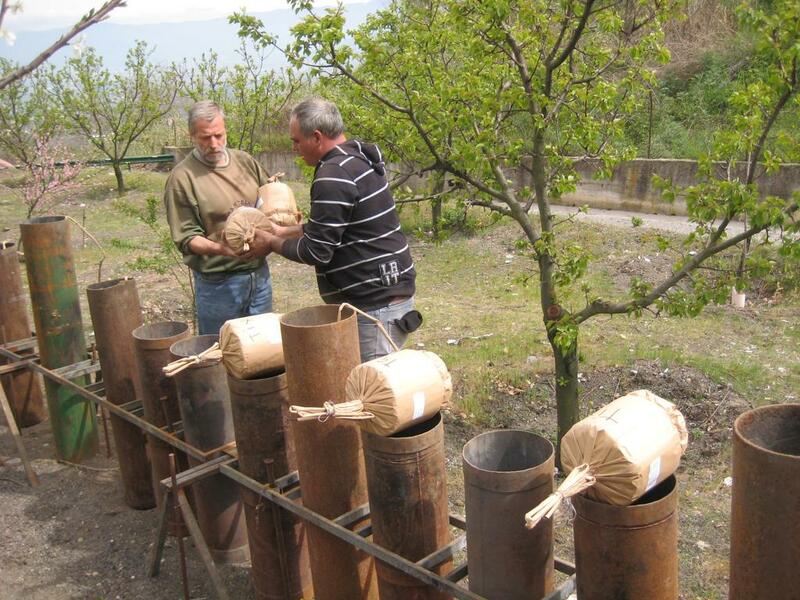 Mortar 4, 5 and 6 are loaded with these shells. An example of "fermata" shell number 491: (ripresa + botto + ripresa + botto + ripresa + botto + ripresa + botto + ripresa) + controcolpo. This shell with the superscription "5S 5B o" written on the outside indicate "(ripresa + botto + ripresa + botto + ripresa + botto + ripresa + botto + ripresa) + controcolpo". The complete effect is 5 successive mosaic of salute bombettes and between the mosaic 4 salute bombettes and closed by a bottom-shot. At the right side the third "fermata" shell in this effect with the superscription "5S 5B o". "5S" means "5 Ripresa". "5B" means "5 Botti", the fifth botto means here the "controcolpo" and is double mentioned with the "o" means the bottom-shot. The letter "S" is possibly the first letter of a dialect word in the Province of Salerno. 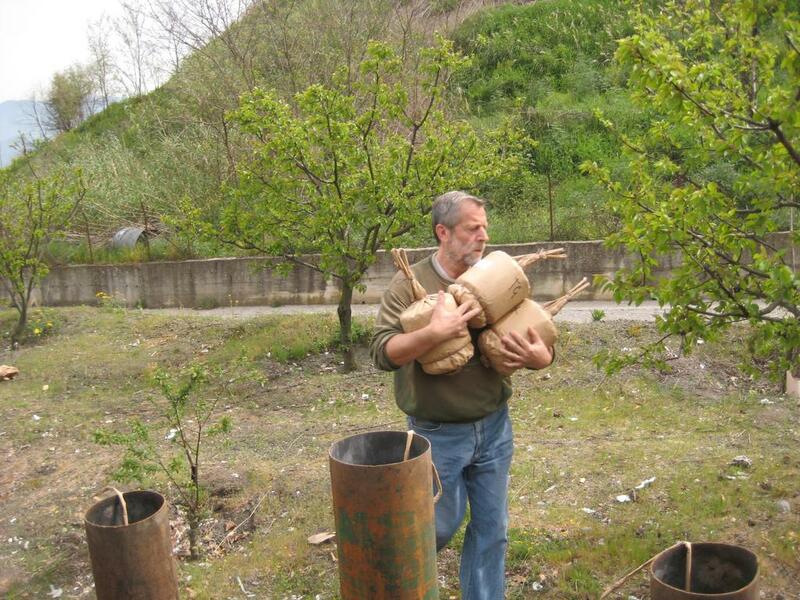 Carmine Senatore loading the sixth mortar with a "5S 5B o", it is the first fermata in this effect. 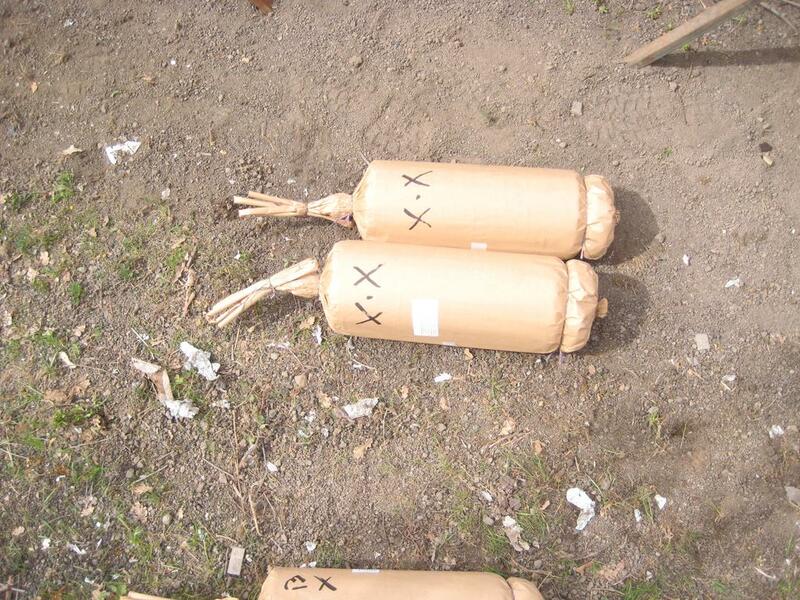 Mortar 7, 8 and 9 are loaded with these shells. An example of "fermata" shell number 57: (intreccio + botto + intreccio) + (controbomba). These photos were taken in the Province of Naples on April 2nd, 2016 preparing for the Festival in the town of Somma Vesuviana. 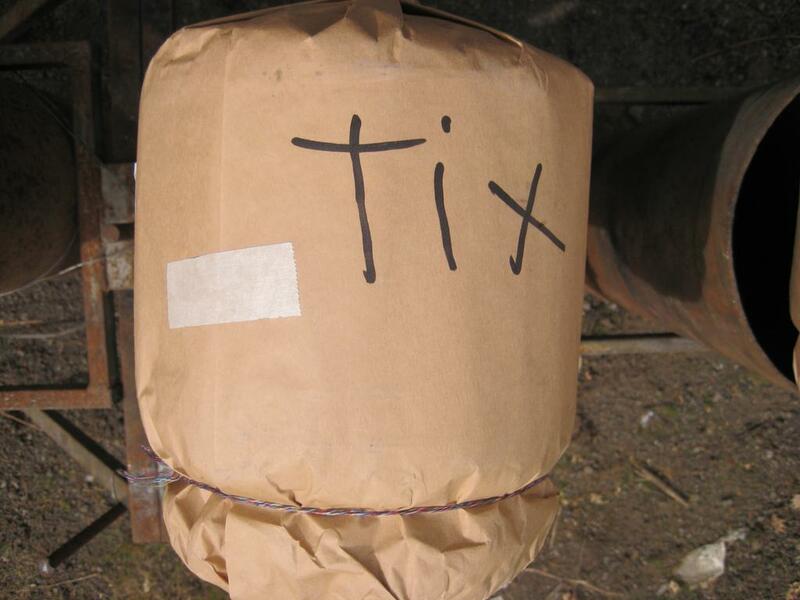 This shell with the superscription "X.X" written on the outside indicate "(intreccio + botto + intreccio) + (controbomba)". The complete effect is in the first break a mosaic of 4 color bombettes in blue followed by a titanium salute bombette and a mosaic of 4 color bombettes in goldglitter and in the second break a bouquet with a heart of blue spherical stars and rings of red cylindrical stars. There are 4 of this type of 16 cm caliber, 2-break shells in this evening display. Two of the "fermata" shells with this superscription "X.X". "X" = intreccio. "." = botto al titanio. 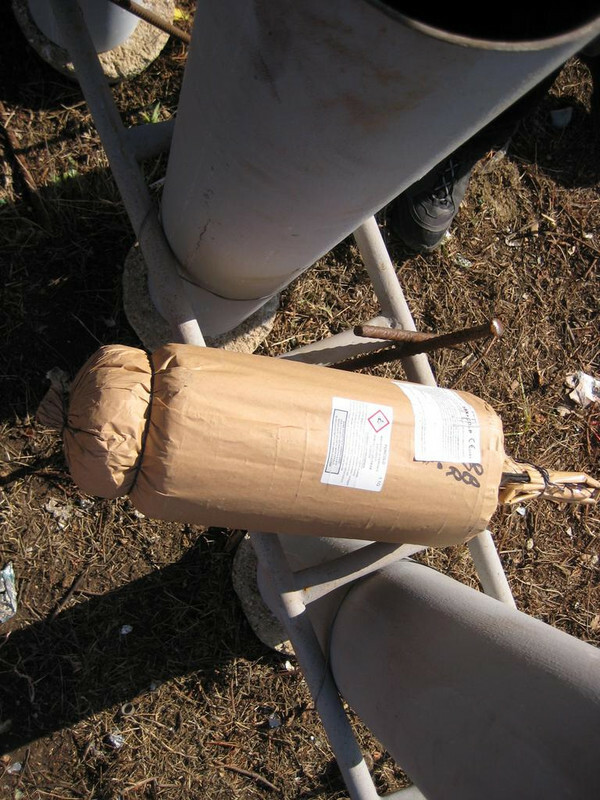 The sign "____" for the "controbomba" is not written on the shell because every fermata in this serie of 16 cm caliber has a controbomba. 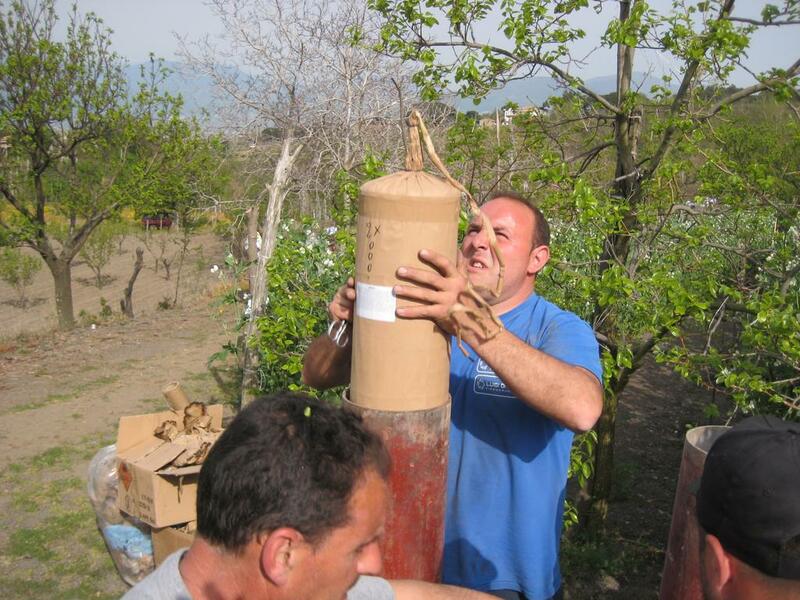 An employee of Boccia & Nappi loading this "fermata" shell "X.X" in mortar 6, mortar 1 to 4 are loaded with fermate in the effect "scala a 8 sfere pampanella + controbomba". 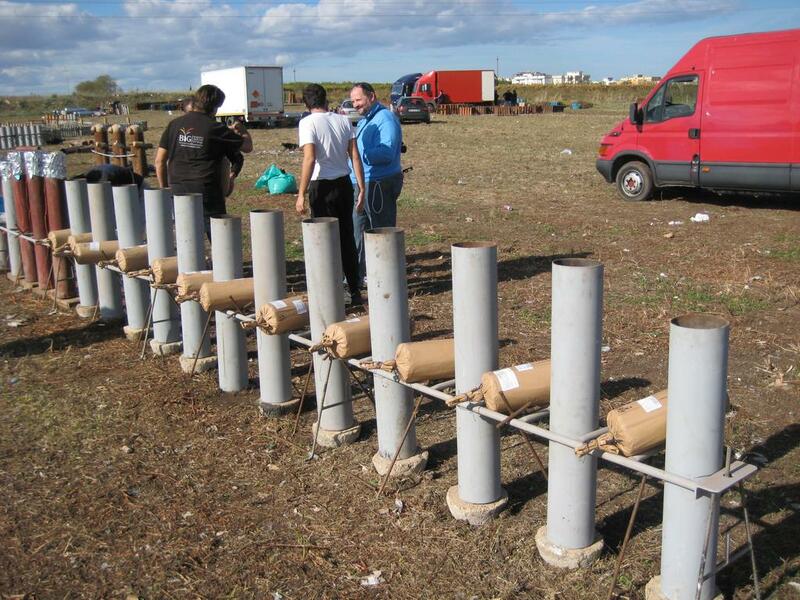 The 12 mortars with the "fermata" shells in 16 cm caliber, filled with from left to right 4 shells "scala a 8 sfere pampanella + controbomba", 4 shells in the effect "intreccio + botto + intreccio + controbomba" and 4 shells "4 botti + intreccio + controbomba". In the video between minute 6.52 and 7.18. An example of "fermata" shell number 428: "(4 botti + ripresa) + (4 botti + ripresa) + controcolpo". This shell with the superscription "4BX 4BX." written on the outside indicate "(4 botti + ripresa) + (4 botti + ripresa) + controcolpo". The complete effect is 4 successive salute bombettes followed by a mosaic of salute bombettes in the first break and in the second break 4 successive salute bombettes followed by a mosaic of salute bombettes and closed by a bottom-shot. Two "fermata" shells with the written superscription "4BX 4BX. ", "4B" means "4 Botti" successively. "X" = "ripresa". "." the point means bottom-shot. The label with the superscription "4BX4BX" without the "colp" of the "controcolpo" (bottom-shot). At the left side of the superscription in smaller letters "2XCB" which means "(2 intrecci) + (controbomba)", two breaks in an evening "fermata" shell. Two "fermata" shells in this effect after the fermata in the effect "(scala a 8 botti) + (scala a 8 botti) + controcolpo". Davide Di Bello loading the first fermata in this effect. At the left side two of the three "fermata" shells in the effect "(scala a 8 botti) + (scala a 8 botti) + controcolpo". An example of "fermata" shell number 290: "(2 intrecci) + (controbomba) + (controbomba) + (controbomba) + controcolpo". These photos were taken in the Province of Naples on April 2nd, 2016 preparing for the Festival in the town of Somma Vesuviana by Luigi Di Matteo. This shell with the superscription "2*ooo." 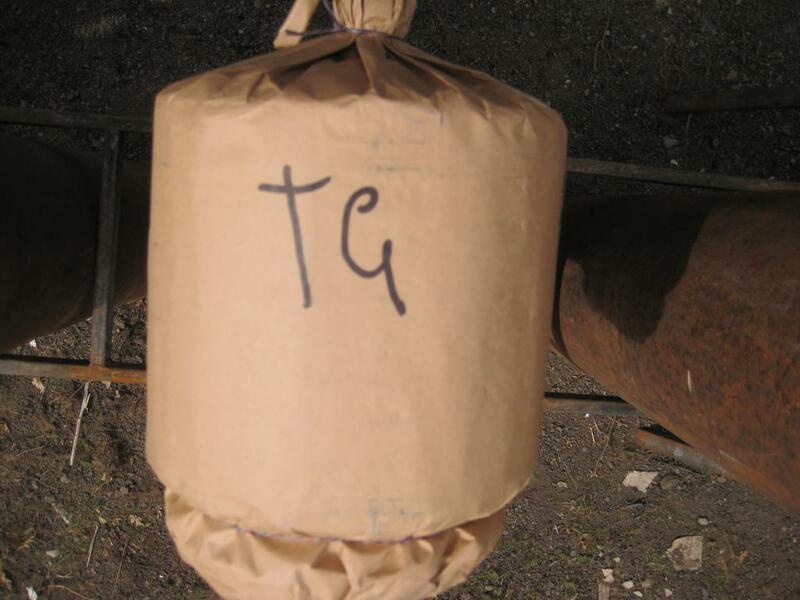 written on the outside indicate "(2 intrecci) + (controbomba) + (controbomba) + (controbomba) + controcolpo". The complete effect is in the first break a mosaic of 7 color bombettes in "pampanella" = white, followed by a mosaic of 7 color bombettes in goldglitter, in the second break a bouquet with a heart of red spherical stars and rings of yellow cylindrical stars, in the third break a bouquet with a heart of blue spherical stars and rings of red cylindrical stars, in the fourth break a bouquet with a heart of purple spherical stars and rings of yellow cylindrical stars and closed by a bottom-shot. Luigi Di Matteo loading the first "fermata" shell with this superscription "2*ooo.". "2*" = 2 intrecci = 2 mosaic in succession. "o" = controbomba = a large bouquet. "." = controcolpo = bottom-shot. 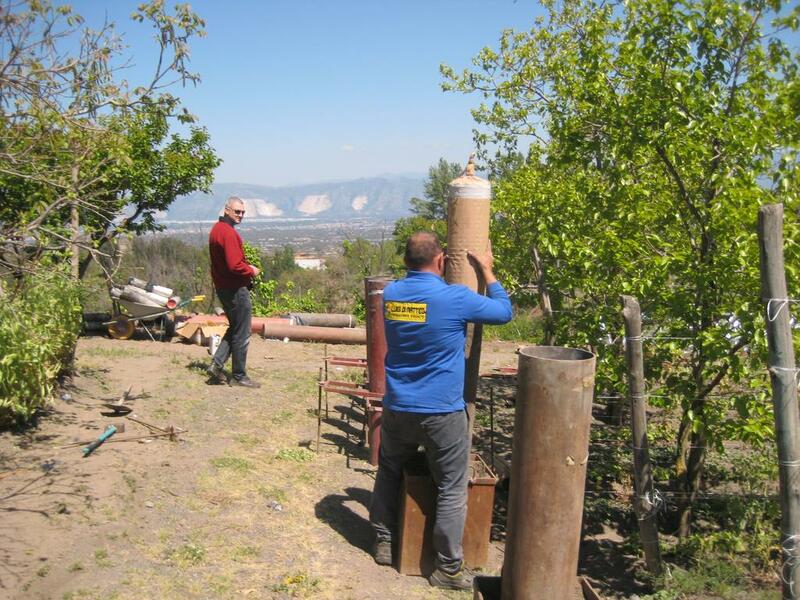 An employee of Luigi with the fermata for mortar number 1 of this serie. 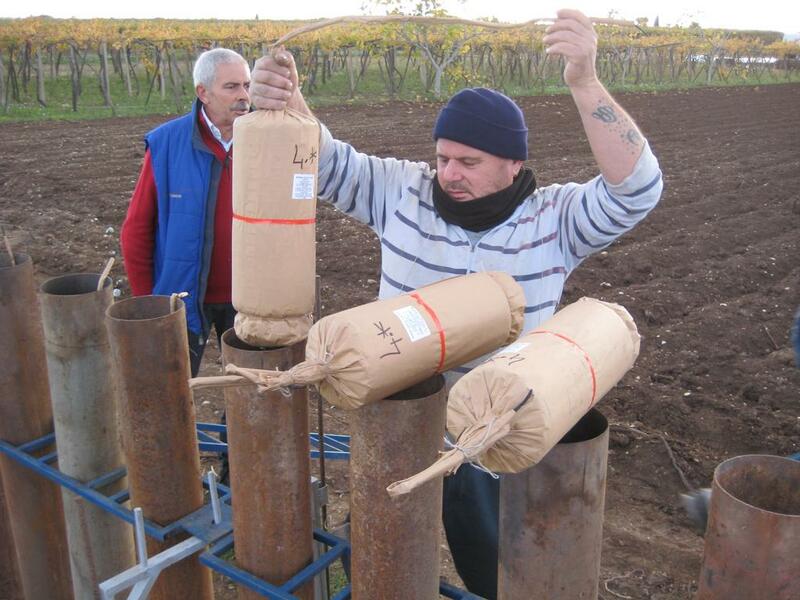 Luigi with the first "fermata" shell in 21 cm caliber of 6 fermate in three different effects: two shells in "(2 intrecci) + (controbomba) + (controbomba) + (controbomba) + controcolpo", two shells in "(3 intrecci) + (controbomba + intreccio) + (controbomba + intreccio) + controcolpo" and two shells in "(2 intrecci) + (2 intrecci) + (2 intrecci) + (controbomba) + controcolpo". In the video of Pirovagando between minute 11.54 and 12.15.